The big central area, full of monitors showing Warhol’s television shows from the 1980s, is reminiscent of the artist’s proposal for the ‘Andymat’, a restaurant full of solitary booths where you could watch TV and eat fast food. There are screens everywhere, including big ones showing grainy movies such as Empire State and Bike Boy. Even the famous Polaroids look like neat little screens, but of course they are facsimiles – Peter Pan pictures that will not fade or discolour any more – showing subjects such as Joseph Beuys, Grace Jones, Debbie Harry and O. J. Simpson in their startled, flashlit youth. 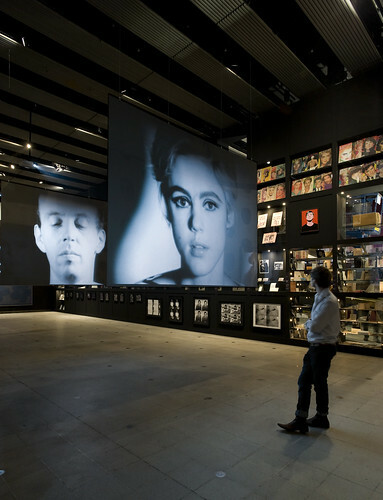 The touring show (previously at the Stedelijk and the Moderna Museet in Stockholm) is on view simultaneously at the Wexner Center for the Arts in Ohio and at the Hayward Gallery at London’s Southbank Centre where it launched last night with a celebrity-packed* private view. They can do two at once because, as designer Rose Epple (of the show’s brilliant ‘Scenographers’, Chezweitz & Roseapple) reminded me, ‘everything is a facsimile . . . nothing is an original.’** Which makes it more like graphic design than anything, and all the better for it. The last panel in the penultimate room, which shows Warhol’s life in 42 pictures, is a photograph of Warhol, shortly before his death, with Miles Davis. Now there’s an artist. * Well . . . Nick Rhodes from Duran Duran and Hanif Kureishi. 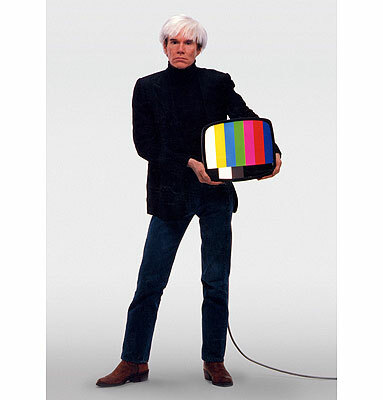 And Richard Hollis, who told me that Warhol once took his Polaroid portrait. ** With the exception of the ‘Time capsule’.